Light-matter interactions inside a turbid medium can be controlled by tailoring the spatial distribution of energy density throughout the system. Wavefront shaping allows selective coupling of incident light to different transmission eigenchannels, producing dramatically different spatial intensity profiles. In contrast to the density of transmission eigenvalues that is dictated by the universal bimodal distribution, the spatial structures of the eigenchannels are not universal and depend on the confinement geometry of the system. Here, we develop and verify a model for the transmission eigenchannel with the corresponding eigenvalue close to unity. By projecting the original problem of two-dimensional diffusion in a homogeneous scattering medium onto a one-dimensional inhomogeneous diffusion, we obtain an analytical expression relating the intensity profile to the shape of the confining waveguide. Inverting this relationship enables the inverse design of the waveguide shape to achieve the desired energy distribution for the perfectly transmitting eigenchannel. 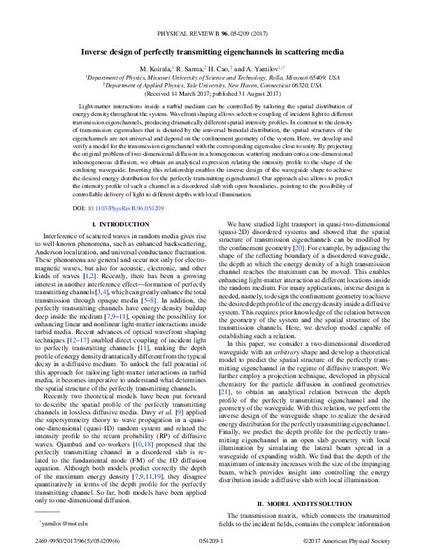 Our approach also allows to predict the intensity profile of such a channel in a disordered slab with open boundaries, pointing to the possibility of controllable delivery of light to different depths with local illumination. The authors acknowledge support from the U.S. National Science Foundation under Grant No. DMR-1205223, from the U.S. Office of Naval Research under Grant No. N00014-13-1-0649, and the U.S.â€“Israel Binational Science Foundation (BSF) under Grant No. 2015509. © 2017 American Physical Society (APS), All rights reserved.